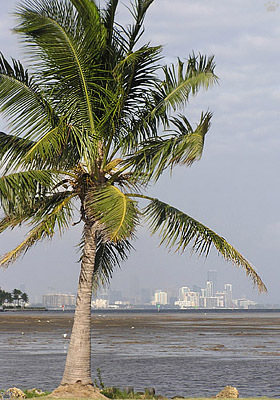 The Florida Peninsula is an island of tropical ciliate, isolated from other tropical lands by the sea and the subtropical areas of the southern United States. It doesn't have much in terms of biodiversity or spectacular views, but if you spend a lot of time there, you can see a lot of interesting stuff. The following pages are a collection of photos I got in three years of studying alligators and crocodiles in Florida, starting with a quick overview of natural habitats, then proceeding to animals and plants. 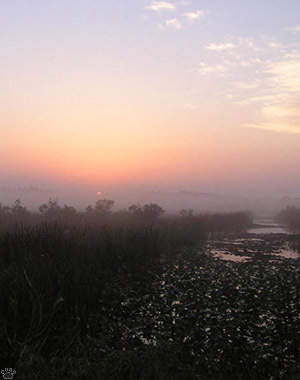 Sunrise in the sawgrass, Everglades National Park. 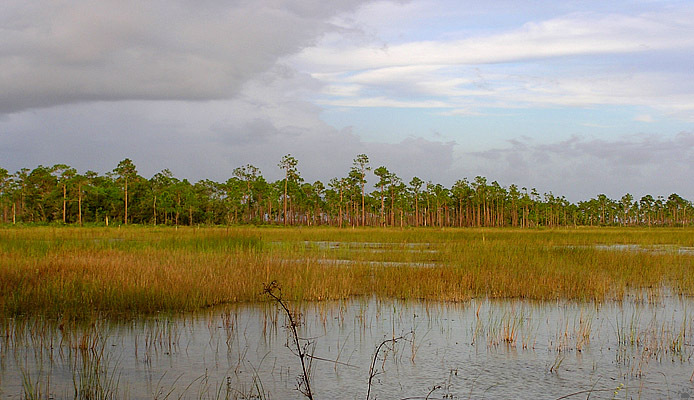 The southern part is mostly occupied by the Everglades - an expanse of seasonally flooded swamp savanna. Screwed up by draining, road building, and development, it is still a huge wilderness area similar to the Pantanal of Brazil. 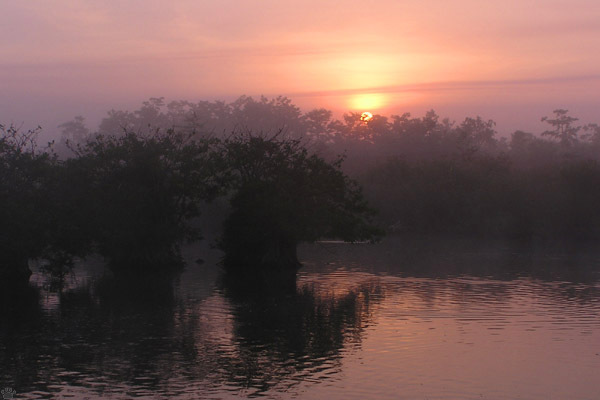 Winter is the most comfortable time in the Everglades. the mudflats are over a mile wide. Snake Bight, ENP. and other biting insects in the world. Snake Bight Trail, ENP. 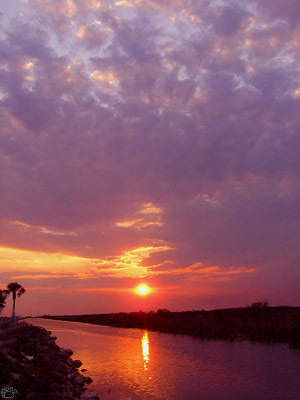 A canal through the Everglades, ENP. 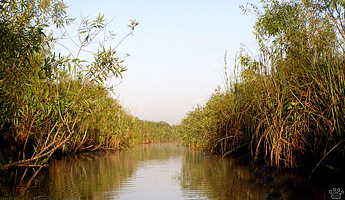 The Everglades used to be "the river of grass" - a thin sheet of water slowly moving from Lake Okeechobee to the tidal mudflats and mangroves of Florida Bay. 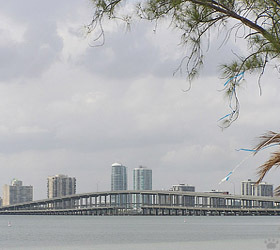 Now much of this water is channeled towards the cities of Miami and Naples. 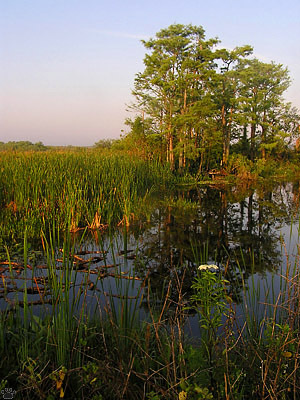 The Everglades, A. R. Marshall Loxahatchee National Wildlife Refuge. 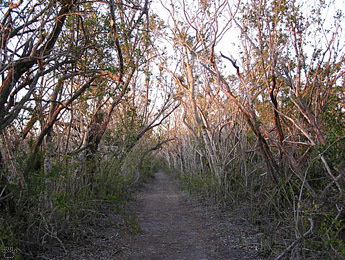 A mountain pass in the Everglades, ENP. 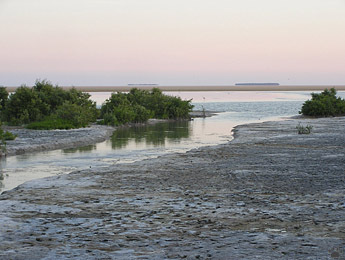 A canal in the Everglades, ARMLNWR. Sunset, ENP. 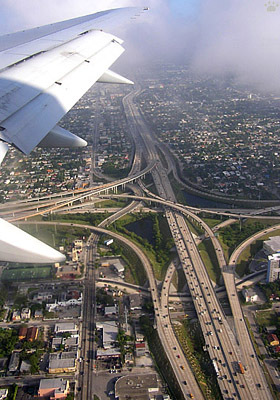 Southern Florida is incredibly flat: the highest point is 15 m/50' a.s.l., but most of the land is much lower. 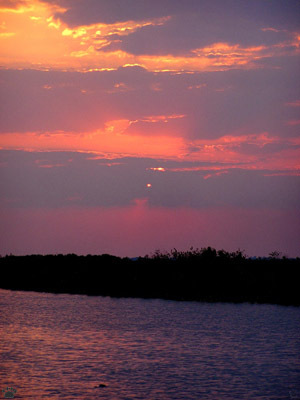 In addition to creating extensive wetlands, this flatness guarantees you a lot of beautiful sunsets and sunrises. 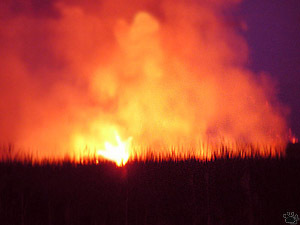 Wildfire, Seminole Indian Reservation. The sunsets get even better at the end of the dry season (October- May), when wildfires fill the sky with smoke. 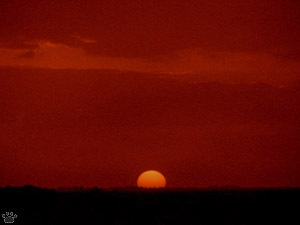 Sunset during wildfire season, ENP. Flooded hammock, Big Cypress National Preserve. Royal Palm Hammock, ENP. 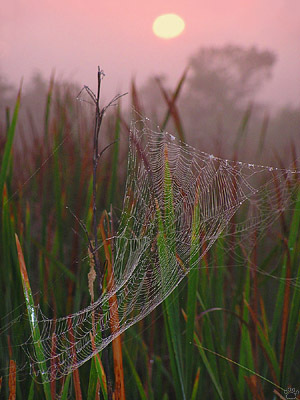 Scattered through the savanna are hammocks - islands of dry tropical forest. 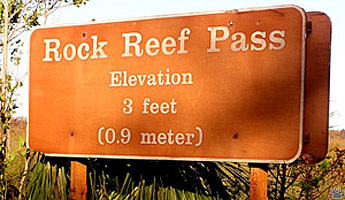 They don't have high canopy, because big trees are often broken by hurricanes. Each hammock has its own combination of plant and animal species. 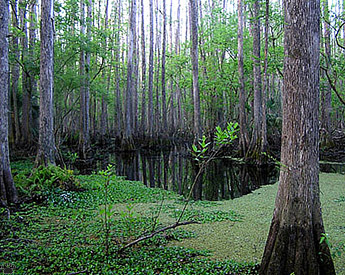 Cypress swamp, Big Cypress National Preserve. 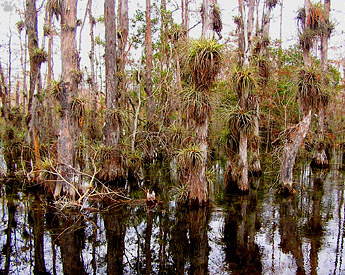 Cypress trees overgrown with bromeliads, BCNP. 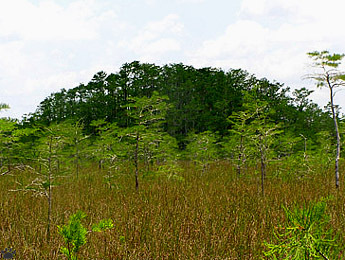 Cypress forest, BCNP. 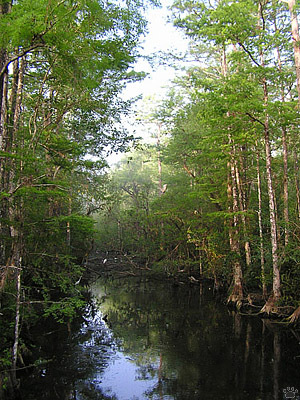 Some parts of Florida are covered with beautiful groves of bald cypress (Taxodium distichum). 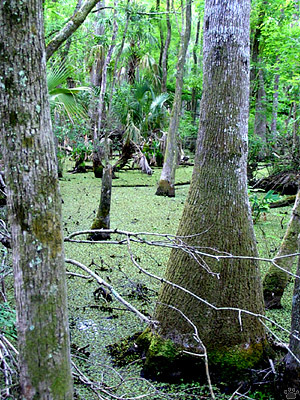 In the Everglades it grows in hurricane- adapted "domes", elsewhere - in extensive floodplain forests. 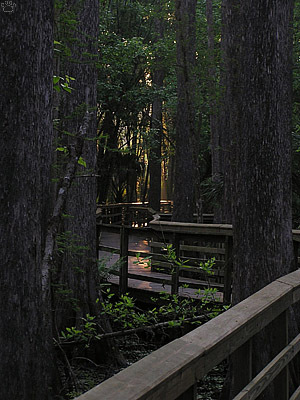 Boardwalk through a cypress swamp, Highland Hammock State Park. 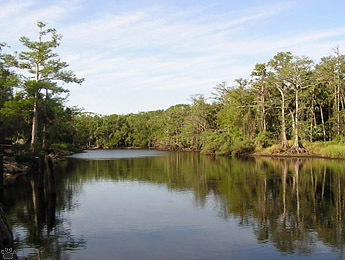 Cypress-lined river, Fisheating Creek Wildlife Management Area. 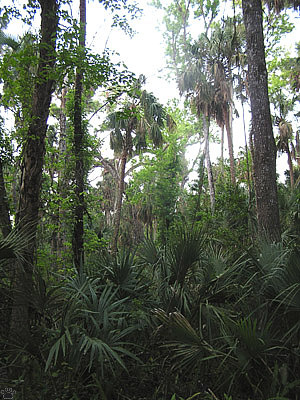 Pine flatwood, St. Sebastian River State Buffer Preserve. In drier places, pine forests grow. 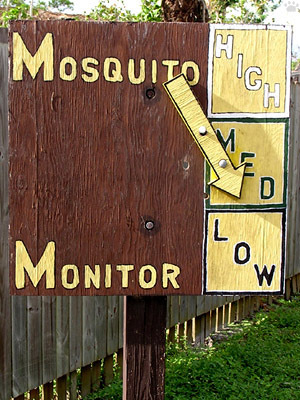 They are now rare in the extreme south, but cover large areas of central and northern Florida. 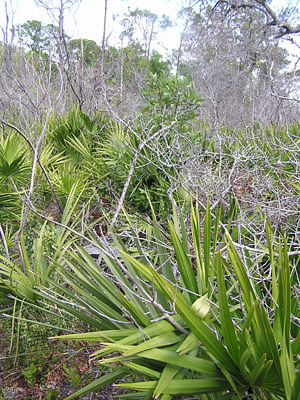 Most of them have undergrowth of fire-resistant palmetto (Sabal), but some have grass or yuccas. 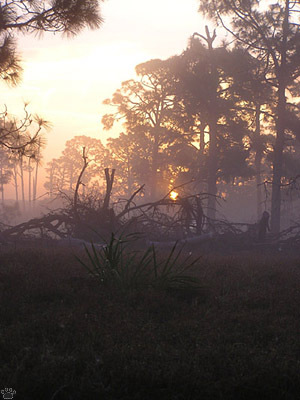 Pine forest, Archbold Biological Station. Oak forest, Split Oak State Park. 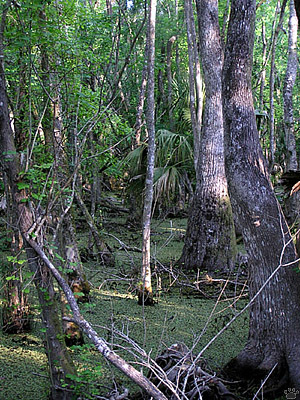 Hardwood swamp, Highlands Hammock State Park. 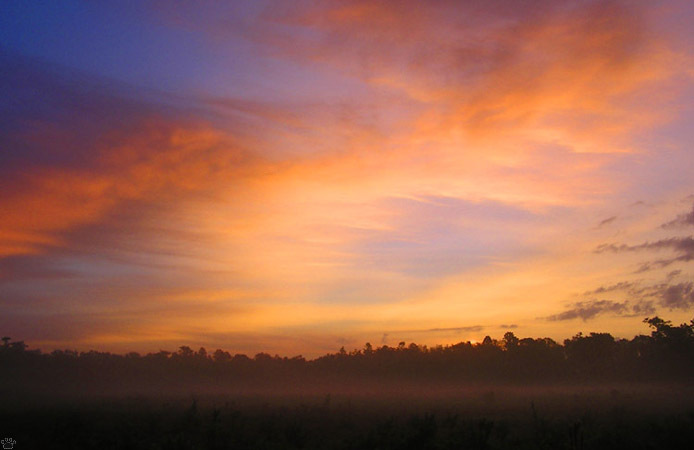 In central and northern Florida, natural habitats are even more diverse. 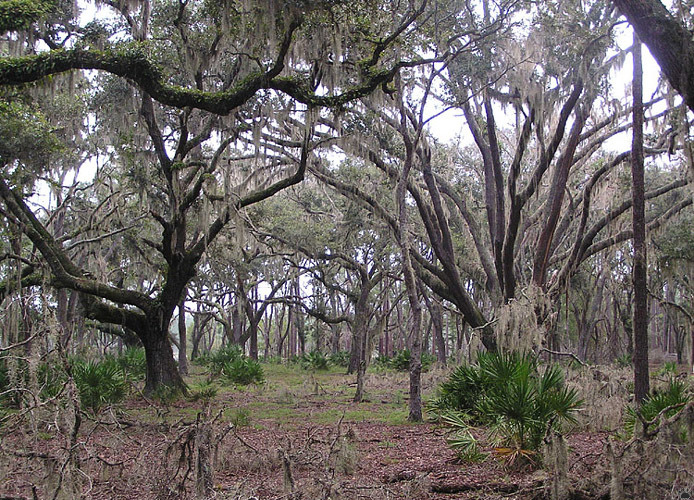 There are beautiful hardwood forests, open forests of live oak (Quercus virginiana), sand scrub, dunes, coastal meadows, and limestone flats with numerous sinkholes. 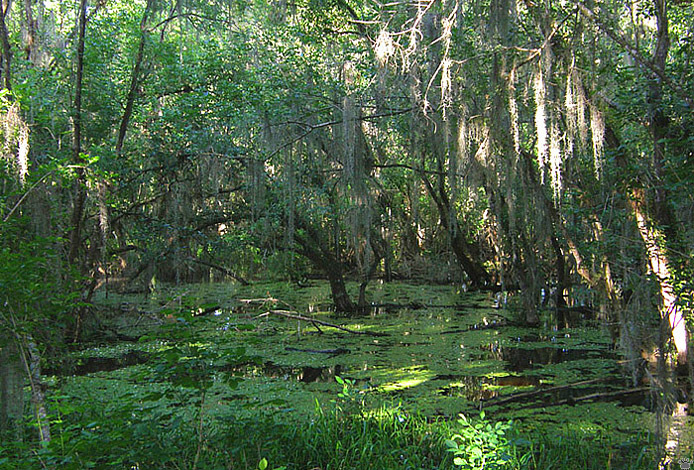 Hardwood swamp, Lower Suwannee National Wildlife Refuge. 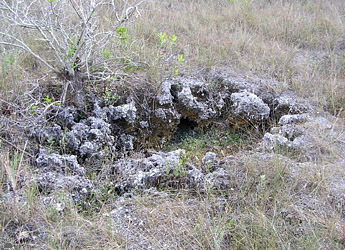 Medium-size sinkhole, San Felasco Hammock State Park. 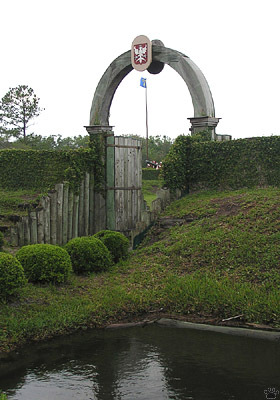 Large sinkhole, near Gainesville. 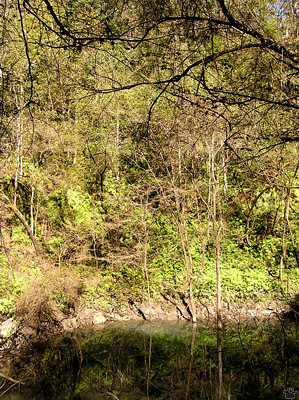 Much of the Peninsula is too flat to have deep caves, except a few flooded ones. Only in the north can you find a few large caves you can walk into. 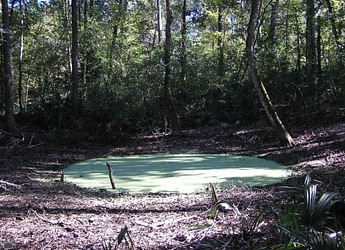 But there are some beautiful karst springs scattered in the forests and swamps of central Florida. 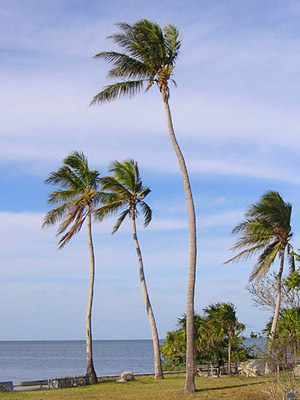 Introduced coconut palms (Cocos nucifera), MHSP. 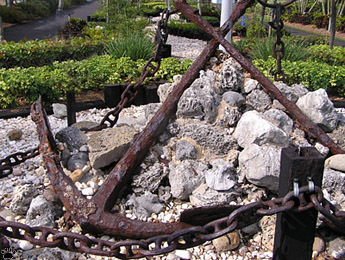 Anchors from Spanish galleons sunk by a hurricane off Key Largo in 1733.
in the eastern United States. 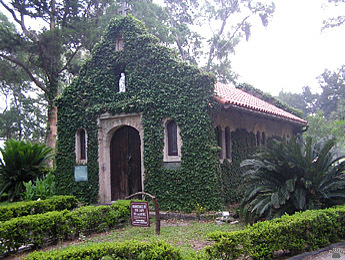 St. Augustine. destroyed by the Spanish in 1565. 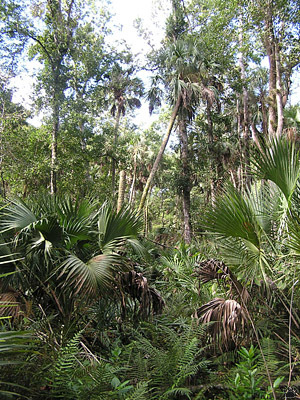 Florida has been populated for at least 14,000 years, and most large animals have been killed off in late Pleistocene. The Europeans had trouble seizing the mainland: most cities have been founded on offshore islands. Local Seminole Indians are the only tribe in the USA that has never been completely defeated by the invaders, and never signed a peace treaty with the US government. 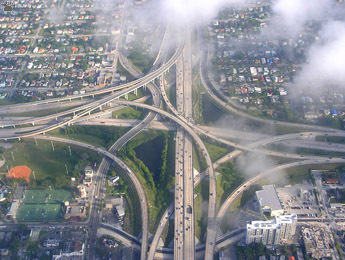 Aerial views of eastern Florida. 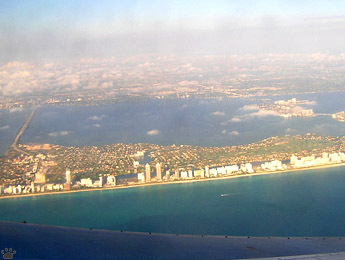 Aerial view of Miami Beach. 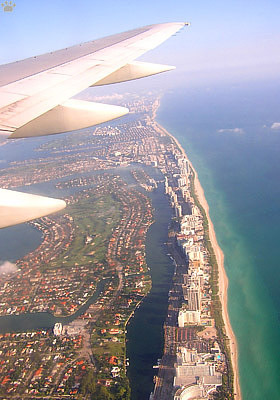 Nowadays, the most densely populated part of Florida is the eastern coast. It is formed by rimrock - a low lomestone ridge, where building cities is much easier than in sands and swamps of the interior and the western side. Almost all of the 400 mile-long eastern coast has been turned into urban landscape. 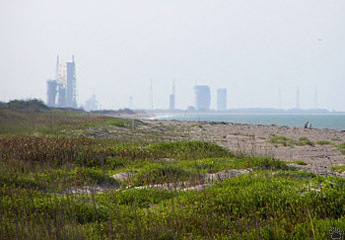 Cape Canaveral is the only remaining long stretch of relatively pristine beach. Launch sites, John F. Kennedy Space Center, Cape Canaveral. 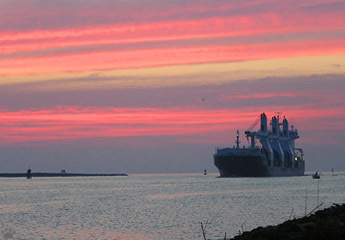 Cargo ship, Cape Canaveral Channel. 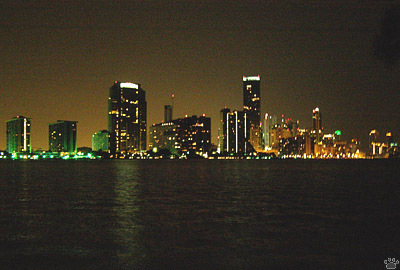 Downtown Miami. With the population at 18 million and rapidly growing, the remaining natural habitats are under immense pressure. Fortunately, the best places usually have at least some legal protection. They are very vulnerable to rusing sea levels, but that's another story. 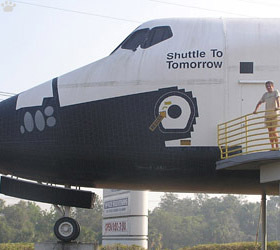 John F. Kennedy Space Center, Cape Canaveral.